In this season of Thanksgiving, I am truly grateful for many things. For family and friends, for those who read and follow my blog, for health, a warm home and most of all to God for his grace and mercies which are new every morning. 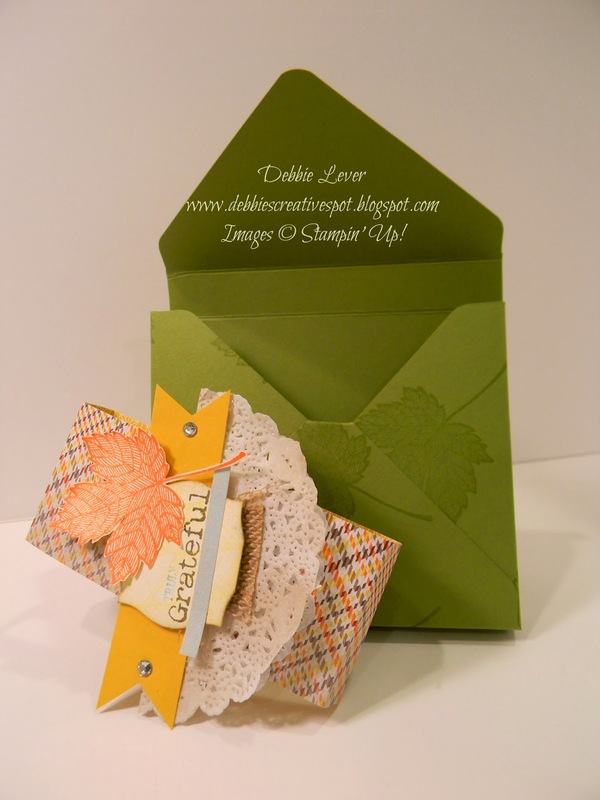 Today's sample is a box I created using the Envelope Punch Board. Basically I made an envelope giving it extra score lines to make a box. I will try and get a tutorial up soon. The belly band was fun to make. 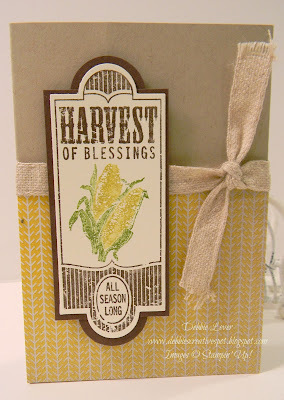 A strip of Sweater Weather Designer Series Paper, Doily that was sponged with crumb cake ink, crushed curry scrap of cardstock cut to make a banner, Truly Grateful stamped and cut out using the Apothecary Accents Framelits and lightly stamped with a background, just a strip of scrap Sweater Weather paper to accent and cut out of the Maple Leaf Stamp. Of course a little bling doesn't hurt either so I added the rhinestones. Inside the box are four notecards. 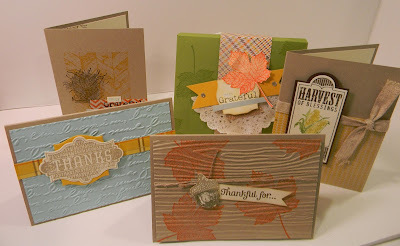 I used two different stamp sets to make these - Truly Grateful and Harvest of Thanks. Having products that coordinate makes crafting so much easier. 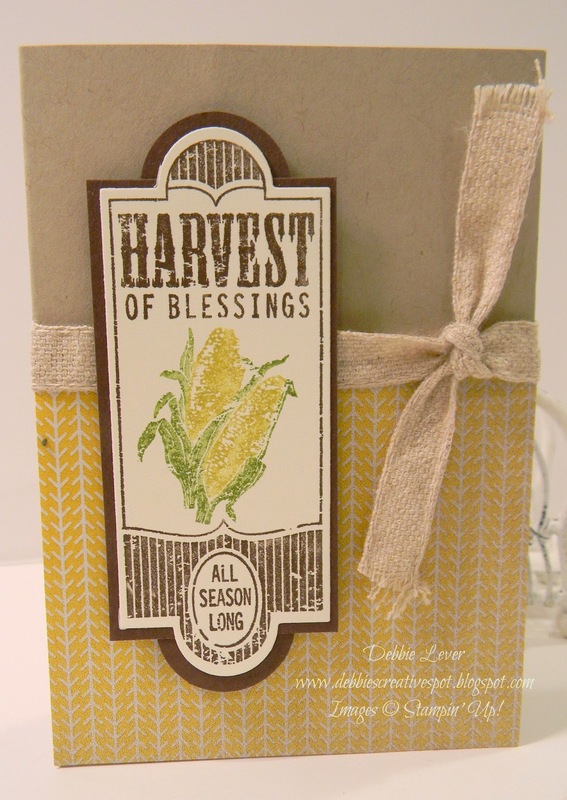 The Apothecary Accents Framelits coordinate with the Harvest of Thanks Stamp set - I stamped the thanks and used the matching Framelit to cut it out on my Big Shot. To Make the boarder around the cut out image, I cut a piece of Chocolate Chip cardstock to fit the back of the rectangle, then punched two circles using the 1" circle punch and adhered them. It looks like a complete boarder of Chocolate Chip cardstock then!